With the deadline for the worldwide registration for the 2016 elections coming to a close on October 31, premier Filipino network The Filipino Channel (TFC) and implementing arm of the Overseas Voting Act, Department of Foreign Affairs (DFA) Overseas Voting Secretariat (OVS) join hands anew to propagate the overseas Filipino’s (OF) right to vote. TFC and DFA – OVS, partners since the 2013 elections, recently entered into a memorandum of agreement on August 26 at the ABS-CBN Corporation headquarters in Eugenio Lopez Jr. Communications Center (ELJCC) in Diliman, Quezon City, Philippines to renew their commitment. 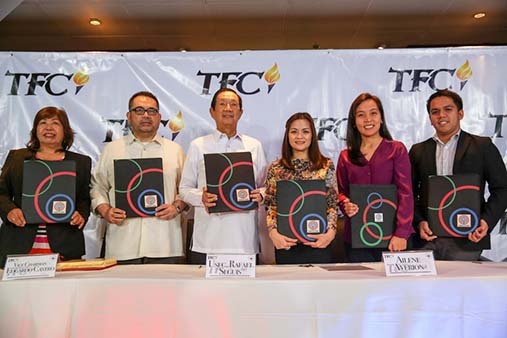 Since 2012, TFC has been laying out its platforms for the promotion of the OV act. The network opened its events for on-site registration efforts and tapped no less than personalities such as Boy Abunda, Pokwang, Sam Milby, Eric Santos and Piolo Pascual to banner the 2012 campaign and Ted Failon, Atom Araullo, Maan Macapagal, Robi Domingo and Kim Chiu to headline the 2013 campaign. Through concerted efforts of both public and private sector, the 2012 registration reached a milestone when it hit nearly a million total registered voters. Moreover, in April of 2015, TFC’s campaign “Boto Mo, Kinabukasan ng Bawat Pilipino” earned a Silver Award from the prestigious 20th Anvil Awards held in Manila, for effective public relations communications. Recently, DFA OVS reported a milestone as records showed that new registrants have reached the 600,000 mark, bringing the new total to 608,516. With this milestone, DFA OVS is pursuing more efforts to reach more Filipinos. To date, DFA OVS and COMELEC have opened a total of 13 overseas registration centers (OVRC) in the Philippines to reach Filipinos who are about to leave for overseas whether on a permanent or temporary basis. These are the DFA Regional Consular Office in Davao, San Fernando Pampanga, and Cebu; and DFA Satellite Offices in Robinsons Galleria, SM Manila and Ali Mall; DFA Office of Consular Affairs in ASEAN Business Park in Paranaque; NAIA Terminals 1 to 3 in Pasay City, POEA in Ortigas, Mandaluyong, and Philippine Transmarine Carriers Inc. in Makati City, Marina at Kalaw City, Manila and CFO in Osmeña in Manila; and OWWA Training Center in Intramuros where ABS-CBN Middle East, Europe and Africa News Bureau Chief Danny Buenafe and Head of News Gathering Dindo Amparo personally registered themselves during the launch. Moreover, DFA OVS and COMELEC OFOV completed the global accessibility of the internet voter registration when it launched in Asia Pacific on August 6, enabling more Filipinos of voting age to participate in the 2016 elections. With the partnership, DFA – OVS hopes to reach more Filipinos. For the 2015 campaign, TFC unveiled a public service announcement led by Red Alert and Umagang Kay Ganda host Atom Araullo, that aims to convince the OFs to register employing through the irehistro. Filipinos of voting age by the time of the 2016 elections, can visit irehistro.com.gov.ph, print their completed forms and go to the nearest Philippine post (Philippine Embassy, Consulate General, Mission, or Manila Economic and Culture Office [MECO]), field / mobile voting centers such a TFC events for their biometrics. Deadline for overseas voting registration is on October 31, 2015 while the voting period for the 2016 Presidential Elections is from April to May 9, 2015. For more information visit www.dfa-oavs.gov.ph and www. comelec.gov.ph. Watch out for more updates via TFC’s community board Global Post (What’s Up in the Middle East), Balitang Global and facebook pages worldwide.